Hyrkania is a vast land of prairies, forest, and tundra. Hyrkania is best known for its broad, barren steppes where horse-warriors, masters of the powerful double-curved bow, gallop the great treeless tracts of land. Living in tribal clans and led by Khans, these warriors ride on raids of plunder. They are "lean horsemen in sheepskins and high fur caps lashing their horses and loosing their barbed arrows". In Conan's time it had many city-states, more or less firmly under the control of the Turanian Empire. Autonomous regions were situated along the northeastern shore of the Sea and deep into the interior, with Turanian vassals along the southeastern coast and the eastern caravan routes. The Hyrkanians are tall and slender, with hooked noses and brown or black hair. Their skin is naturally light, but is darkened by the sun and wind of the steppe to a deep brown, almost like a Zingaran. The men wear moustaches, and beards are not uncommon. The Hyrkanians are fearsome warriors. Their horsemanship, combined with their carefully made saddles and skill at their chosen weapons, makes them a terrible raiding force. 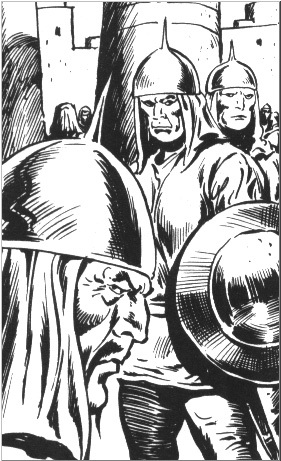 They do not fight the "set piece" battles of the Hyborian argues; rather, they fight when and where they choose. A troop of Hyrkanian cavalry can travel nearly 100 miles in a day, bringing four to five horses per rider, and fight at the end of that day without resting. When traveling, Hyrkanians do not stop to change horses; rather, the warrior vaults from horse to horse, taking his bow case and arrows with him. Hyrkanian archery is legendary. Their recurved composite bow are made from wood, horn and sinew glued together, and take over a year to make and season. The Hyrkanians get the bows from artisans who live in villages or the western slopes of the Mountains of Night in Khitai. The strength of one of these bows is rated by the number of men required to string it. Youths use a "one-man" bow, most warriors use a "two-man" bow, which can also be strung by one man with the aid of a special harness, and the strongest archers use a "three-man" bow. Since these bows cannot be left strung for more than two hours without cracking or losing resiliency, Hyrkanian warriors generally carry two bows. The Hyrkanians do not take slaves, at least not adult male slaves. Sometimes they take young children or non-Hyrkanian concubines, but otherwise they kill those who stand in their way. "We do not want to rule over conquered peoples," say the Hyrkanians, "but over great pastures." The Hyrkanians have little fixed territory to defend. Their nomadic way of life makes them immune to the territorial imperatives of more "civilized" lands. There is one outstanding exception to this impermanence: each Hyrkanian tribe maintains a burial ground, called a kakaba, or City of Mounds, for its kagans and Ushi-Kagans. The kakaba is a secret field of barrows, often concealed in the most inhospitable regions of the steppe. As a sign of reverence to the dead, horse-riding is not permitted in the kakaba. Similarly, it is forbidden to fire arrows into the kakaba, for fear of striking the spirit of one of the tribal ancestors. This makes it difficult to drive invaders from the kakaba. Although these Itakaba constitute a weakness in the Hyrkanian defense, they are not exploited: the Hyrkanians ensure that no enemy who enters the kakaba is permitted to leave alive. The Hyrkanians are ancestor worshippers, who respect the accomplishments of men and the Everlasting Sky. They have no gods, as Hyborians know the term, and whatever cultural influence the Khari had upon their religion has long since been rejected. Some of the westernmost Hyrkanians follow the deities of the Turanians.